Louisiana drivers could get charged with a DWI with a blood alcohol concentration of 0.08% or higher, whether they were driving erratically or not. Drunk driving victims are legally entitled to sue for compensation that covers medical costs for injuries caused by a DUI accident, as well as pain and suffering and lost wages. In addition, plaintiffs may sue for millions of dollars in punitive damages that are designed to send a message to the perpetrator: that it pays to stop and think before getting behind the wheel intoxicated. Depending on the circumstances surrounding the case, sellers and distributors of alcohol prior to the crash can also be held liable. 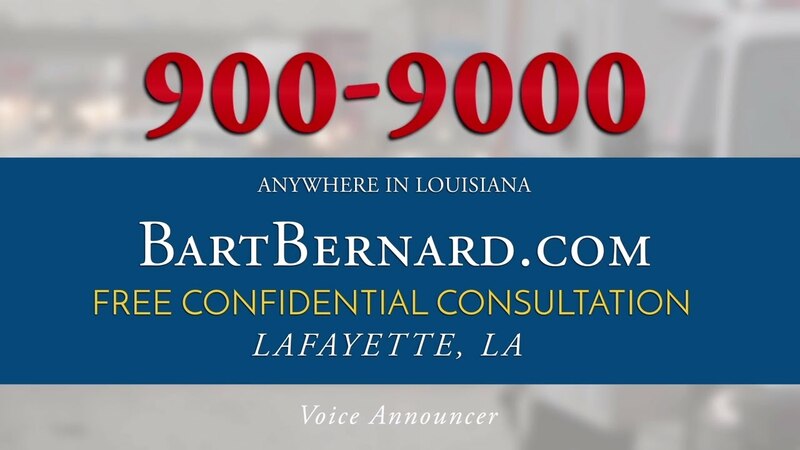 Contact a Louisiana DUI attorney at the Bart Bernard Personal Injury Firm for a free case evaluation. The legal definition of “Driving Under the Influence” (DUI) of drugs or alcohol, or “Driving While Intoxicated” (DWI) with alcohol varies from state to state. Some states differentiate between the two terms with greater penalties for driving while intoxicated, but Louisiana punishes both as the same crime. Under Louisiana’s “Zero Tolerance” policy, minors under 21 can be charged if they have a Blood Alcohol Concentration of 0.02%. Drivers 21 and older will be charged with DWI with BACs of 0.08% or higher. Commercial drivers are held to a higher standard, with convictions starting at 0.04% nationwide. Mandatory interlock laws have been effective. Louisiana has curtailed drunk driving 36% since 2007 since passing a measure requiring convicted DUI offenders to have a breathalyzer and interlock device installed on their vehicles, preventing them from driving their own cars drunk. Laws are getting tougher. In 2015, an update to Louisiana law punishes first time DWI offenders with a minimum of 10 days in jail with 32 hours of community service and a $250 fine. A second offense carries a minimum jail sentence of 30 days. Thousands of drunk drivers are arrested each year. In 2015, 7,500 motorists were arrested for drunk driving. The highest number of arrests occurs between Christmas and New Year’s Day. There are hundreds of DUI accident victims. From 2003-2012, 3,046 people were killed in crashes involving a drunk driver. That’s more than 300 deaths per year attributed to DUI. 29% report using alcohol in the last month. Businesses and Party Hosts: A skilled DUI lawyer can also go after the bar, retailer, or homeowner responsible for furnishing the driver with drinks, even though it was apparent the individual was already intoxicated. These are referred to as “dram shop laws,” which establish that people selling or distributing alcohol to the public have a general “duty of care” that can lead to damages if breached. Employers: In cases where commercial drivers were intoxicated, employers can be sued for ignoring past history of substance abuse or for failing to routinely test their drivers. Auto manufacturers and Technicians: Vehicle recalls and known safety risks with vehicle components may play a part in a drunk driving accident. Non-impaired Motorists: Sometimes other drivers on the road act inappropriately, which contributes to the accident. Local Municipalities: Roads with large pot holes or unsafe construction zones can be traced back to the city, county or state as partially liable for some crashes, whether alcohol was involved or not. Being a “Fault State,” Louisiana insurance follows a system where whoever is legally “at fault” for causing the accident is liable for paying the personal injury and property damage resulting from the crash. For most crashes, the negligent driver’s car insurance would compensate the victim for damages related to the accidental or even negligent and reckless conduct that causes an accident. However, most policies specifically exclude coverage for “intentional conduct”– which includes drunk driving – that will knowingly lead to harm. In some cases, victims may qualify to use their own uninsured/underinsured motorist coverage (UIM) when the at-fault driver cannot pay. However, the cap on this type of coverage is usually only $15,000 – and most medical bills exceed this amount by far. That is why it is necessary to seek the help of a drunk driving accident lawyer. Compensation may limited if you suffered a soft tissue neck or back injury with no visibly documented damage that resolved itself in the course of a few months. It may also be reduced if you were somehow at-fault or determined negligent. Bart Bernard is an experienced drunk driving accident lawyer in Louisiana with a strong track record of successful settlements and verdicts in cases where alcohol impairment produced serious injuries and/or wrongful death. It costs nothing to speak with an attorney about your case, whether you were a drunk driving accident victim, a passenger in a drunk driver’s car, or the loved one of an injured victim. Call today for answers to your concerns and questions.